One of the most famous samurai stories in Japan is the 47 Ronin, (also known as Chushingura). In 1701, Lord Asano, confronted Lord Kira in Edo Castle and drew his sword. Because it was forbidden to use a sword inside the castle, Lord Asano was sentenced to death, and committed ceremonial suicide (seppuku). Asano’s loyal retainers became ronin (samurai without a leader), but vowed to avenge their lord’s death. On December 14, 1702, they attacked Lord Kira in his mansion and whacked off his head. The 47 ronin took Kira’s head to the Sengakuji temple, where Lord Asano is buried. Later the ronin also committed seppuku and are buried together in the same temple. These events took place in Edo (Tokyo), and today kids can visit Lord Kira’s residence and the Sengakuji Temple. In the 1700’s, Lord Kira’s mansion was huge, it took up the whole block, but only a small part of original estate remains. When you visit today, in the white-walled courtyard, a shrine on the left honors Kira’s retainers killed in the attack. The dramatic statue in the center is Lord Kira, seated and wearing a black and red robe. On a snowy December night, the 47 ronin, disguised as officers of the fire brigade, attacked Lord Kira’s well-defended mansion from front and back, hopped over the walls, fought his men with swords, and finally located Kira hiding in a secret courtyard. After the ronin killed Kira, they took his head to the Sengakuji temple, and placed it on Lord Asano’s tomb. Lord Asano and his wife, along with the 47 ronin, are buried at the Sengakuji Temple in the Takanawa neighborhood. When you first enter temple area, on the right is a bronze statue of Oishi Kuranosuke – leader of the raid. In his hand is a scroll with the list of the 47 ronin. Stop into the Ako Gishi Memorial Hall museum to see original samurai helmets, masks and armor, and two statues of Oishi and his teenage son Chikara, who participated in the attack. Also, in a separate building is a spectacular display of 47 wooden statues of each ronin. On the path to the graveyard, you’ll pass by a well. When Asano’s retainers returned to the temple with Kira’s head, they first washed it in this well, before taking it to the graveyard. At the graveyard, on right side are two tombs: Lord Asano and his wife. Continue walking further, go the steps to see lines of stone markers for each ronin. The single stone marker topped by a roof is Oishi’s grave. 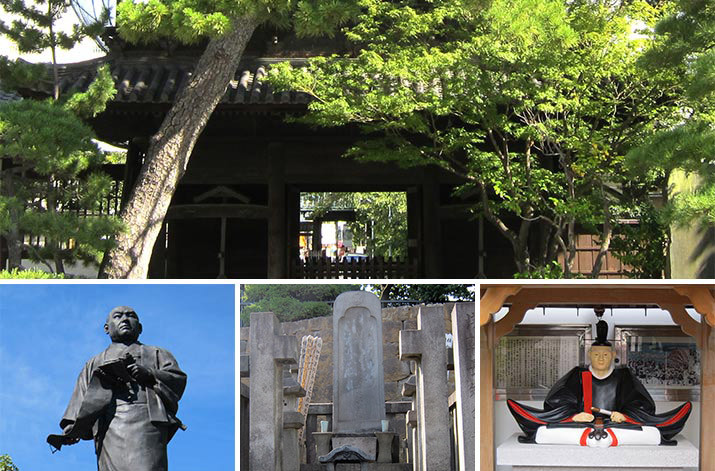 Tip: The Sengakuji Temple, beautifully preserved, is our favorite samurai locale in Tokyo. It’s easy to get to on the subway, and in the temple, the past really came alive for us. Lord Kira’s Residence is a bit harder to find, and only the courtyard of his great mansion remains.